For me, the twisted humor in War of the Human Tanks really hits the spot. I instantly fell in love with the name of the game – I mean, human tanks, anyone? The rest didn’t disappoint once I played it, either. Using Shock Tanks to carry self-destructing messages? Rewarding the pitiable tanks with cola for a bloody battle? Protagonist’s complete disregard for orderly behavior? I absolutely love it. There’s nary an episode that hasn’t managed to wring at the very least a wry grin out of me. Since most of my time is spent working on the script, I can very much appreciate the humor in it. 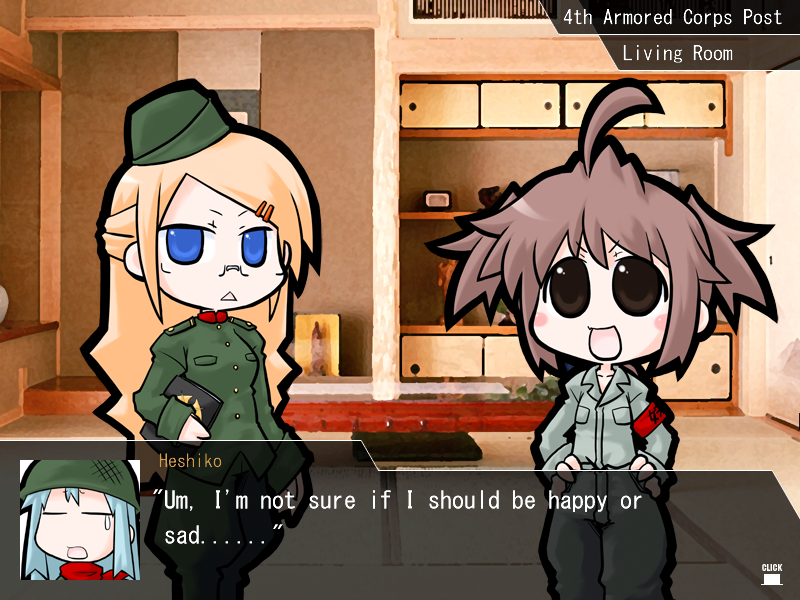 And I must add, Heshiko‘s distressed face is especially cute… if you know what I mean! I don’t know if you ever played the game Battleship but the way you make blind shots while trying to guess at the enemy’s location in Human Tanks reminds me of Battleship in a positive way, especially when you are dealing with units larger than a single hex. I also love customizing my units and how this changes the whole experience, oftentimes in funny ways. For example, I have this Hikari model tank that hits an immense area when she attacks with the Shooting Area +1 module I had her equip. I also wanted her to be fast, so I equipped her second slot with a Modem, increasing her speed by one. But because her range isn’t long enough to compensate, whenever she fires she hits herself as well. Luckily she occupies four hexes, so she won’t kill herself if I’m careful, but she’s also helping the enemy take her down making this a double edged sword, a very silly one at that. This game is stupid! I can’t get any work done because I just keep playing it. It’s horrible!! I’ve had a blast with the game’s story. The supposed seriousness of warfare is contradicted by the wacky antics of the 4th Armored Corps in such an innocuous manner one can’t help but laugh. The scenario’s has just the right balance between battles and dialogue to constantly keep me entertained. Oh, and the soundtrack always gets me rockin’ along! Theres something really satisfying about the battle preparation in WOHT, spending supplies to upgrade and assemble my human tanks, then strategically deploying them on the battlefield. 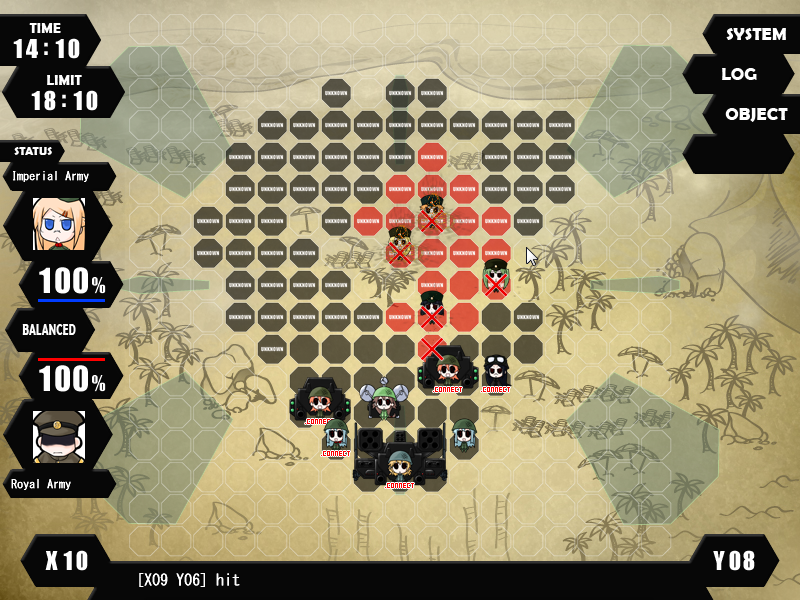 I spend a good chunk of my time when I play the game just thinking about my strategy, considering my options, and putting together my personalized army for each battle.